The European Space Agency's Copernicus Sentinel-2B satellite takes us over Alaska’s Columbia Glacier, one of the most rapidly changing glaciers in the world. 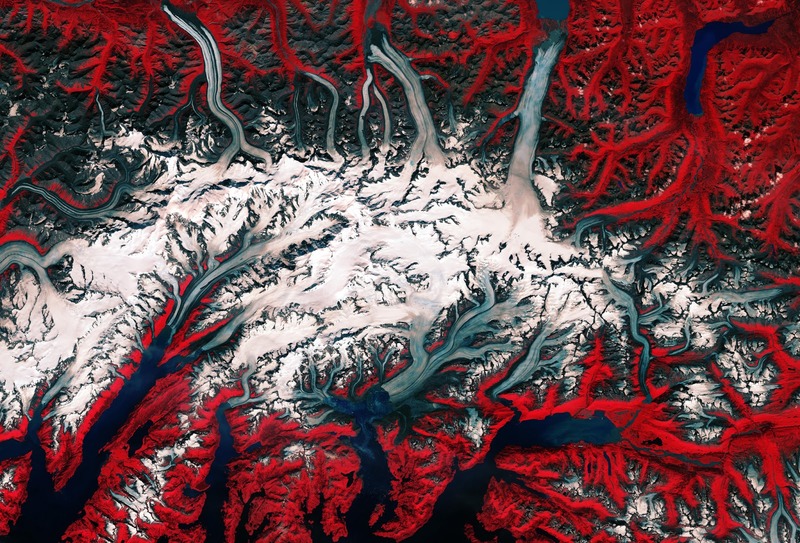 The glacier, which can be seen just below the middle of the image, flows down the snow-covered slopes of the Chugach Mountains into the Prince William Sound in southeast Alaska. Over the last three decades, this tidewater glacier has retreated more than 20 km and lost about half of its total thickness and volume. The changing climate is thought to have nudged it into retreat in the 1980s, resulting in its end—or terminus—breaking off. The terminus had previously been supported by a moraine, which is an accumulation of sediment and rock that served as an underwater barrier, helping to keep the glacier stable and insulate it from seawater. With this barrier gone, glacial dynamics took over and it began to flow to the ocean faster, calving large icebergs into the Sound. As this satellite image shows, many icebergs can be seen in the Sound. This one glacier accounts for nearly half of the ice loss in the Chugach Mountains. However, researchers believe that the Columbia Glacier will stabilize again—probably in a few years—once its terminus retreats into shallower water and it regains traction, which should slow the rate of iceberg calving. This image, which was captured on August 5, 2017, is also featured on the Earth from Space video program.